IHSE USA, a global provider of ultra-fast and secure KVM matrix switch and extender solutions for broadcast related environments and government agencies announced the new 484 Series VGA 8 x 1 CPU Switch/Converter allowing up to 8 VGA CPU sources to be connected and switched through a single DVI extension port. The extension port can be connected directly to a workstation receiver or attached to one of the IHSE tera enterprise or tera compact matrix switch ports for distributed access. The 484 CPU switch is a 1RU 8-port VGA KVM switch providing high-resolution output up to 1920 x 1200. Two models are available; L484-8VECWR for cat-x and L484-8VESWR for fiber. These units are ideal as a cost-savings solution for classrooms, control centers and digital signage applications where you need to maintain and share legacy analog sources without taking up multiple ports of a KVM matrix switch. The 484 CPU switch allows users to share up to eight computers to one remote monitor, keyboard and mouse. With IHSE’s exclusive high efficiency conversion algorithms, each input port has a built-in scaling function that maintains video integrity for clear and sharp images up to 1920x1200 @60Hz. Each input port provides for a VGA (HD15 connector), USB-HID (Type B) and stereo audio (3.5mm) connections. All settings are stored in non-volatile memory for retention should a power failure occur. 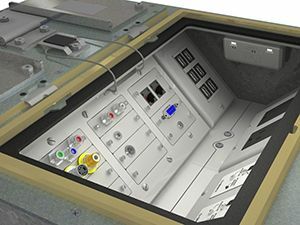 For systems where 24/7 operations are critical, the enclosure includes redundant power and redundant output extension connections to support either two cat-x or fiber cables. When the 484 CPU switch is used as part of a larger matrix switch system the second output port provides a simple matrix by-pass point-to-point connection or connection to a second matrix should a path failure occur in the primary matrix switch. For added safety, each IEC power connection supports a locking AC cords to prevent accidental unplugging. The 484 CPU switch can be attached to any input port on an IHSE tera enterprise or tera compact switch. This creates an efficient use of matrix ports when only a few legacy VGA devices need to be accessed. The 484 CPU switch eliminates the expense of individual units, increases office work space and lowers total energy cost. It is an easy and efficient way to organize and streamline an expanding computer room while reducing the overall cabling and interconnect needs. The built-in VGA to DVI processor converts varying input signals and scales them to match the set resolution of the output display requirements. Each unit includes a local mini-USB port for firmware upgrades and a local USB 2.0 port (480 Mbit/s) for active USB data transfer. The Intelligent EDID processing is handled with hot key commands allowing immediate EDID updates to each VGA port on the switch. Switching between sources is fast and easy by entering hotkey combinations from a keyboard (OSD) to get a menu-driven on-screen display, or via an easy setup browser window application. Additionally, the unit can be integrated into larger matrix switch systems and controlled via IHSE’s exclusive Matrix Grid Manager.